Be the first to share your favorite memory, photo or story of E.. This memorial page is dedicated for family, friends and future generations to celebrate the life of their loved one. Evelyn Jean Hostetler, age 91, of Orrville peacefully passed away Thursday, October 25, 2018 at Shady Lawn Nursing Home in Dalton with her family by her side. A graveside committal service will be held Monday, October 29, 2018, 11:00am at East Chippewa Church of the Brethren, 7207 Chippewa Rd, Orrville, OH 44667. Following at 11:30, there will be a memorial service in the church sanctuary with Pastor Brad Kelley officiating. There will be no prior calling hours. Memorial contributions may be made to LifeCare Hospice, 1900 Akron Rd, Wooster, OH 44691 or East Chippewa Church of the Brethren. Jean was born July 31, 1927 to John & Clara Blankenhagen Kiener in Akron, OH. She attended Orrville High School and graduated in 1945 where she met John Hostetler and they married on January 4, 1948. They celebrated almost 70 years of marriage together before his death on June 21, 2017. Jean retired from United Telephone Company of Ohio. She also enjoyed working at the Orrville Public Library when her children were young. 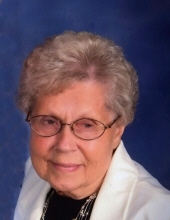 Jean was a member of the East Chippewa Church of the Brethren where she had been a chorister for the children and adult choirs, pianist, sung in the adult choir and was a deacon. Jean loved to read, listen to classical and spiritual music and spend time with her family. When her grandchildren were young, Jean loved to organize a special Christmas celebration with them showcasing their musical abilities. Jean & John loved to travel within the United States to visit friends and relatives and see new places. Jean is survived by her children Kathleen (Erick) Hendrickson of Louisville, OH, Carol (Rick) Gregorich and John (Becky) Hostetler, both of Dalton, OH. She has five grandchildren, Amy Nuesch, Andrew (Jill) Hostetler, Travis (Jenna) Gregorich, Scott (Alisha) Hostetler, Allison Hostetler and four great-grandchildren, Charlotte Nuesch, Grace and Nora Hostetler and Veraline Gregorich. Surviving also is a brother, John Kiener, of Sarahsville, OH. She was preceded in death by son, Andrew Lynn, in infancy and sister, Mary Elizabeth Kiener. The family wishes to express its utmost gratitude to the staffs of both Shady Lawn and LifeCare Hospice for their compassionate care of mom and family as we neared the end of her life. To send flowers or a remembrance gift to the family of E. Jean Hostetler, please visit our Tribute Store. "Email Address" would like to share the life celebration of E. Jean Hostetler. Click on the "link" to go to share a favorite memory or leave a condolence message for the family.